Plus the game will have the largest roster to date. WWE 2K17 is going to be somewhat different to the previous titles in the series, as 2K Games detail the changes in store for the new title. The Universe mode aims to recreate the drama of the weekly shows, so that “players feel like they are playing through a weekly episode of any WWE television or WWE Network program.” They’ve also thrown in pre- and post-match attacks and run-ins, to increase the TV show vibe. MyCareer features the new Promo Engine that will have wrestlers calling out or responding to other “WWE Superstars,” while backstage brawl gameplay adds to the atmosphere. WWE 2K17 is scheduled for release on October 11 on PS3, PS4, Xbox 360, Xbox One. Virtual Pro Wrestling 2 sorta had promos, you held down one button and when they got in the ring they said something. There's also a bit on Revenge where there's a backstage bit of Bischoff and the nWo but don't think that part was included in the main game. Was thinking on WrestleMania Challenge on the NES why they included the 'Yourself' character when they had a really strong talent roster at the time. Unless they were going to include Dusty and they subbed him out for 'Yourself' when he went back to Jim Crockett Promotions/WCW. 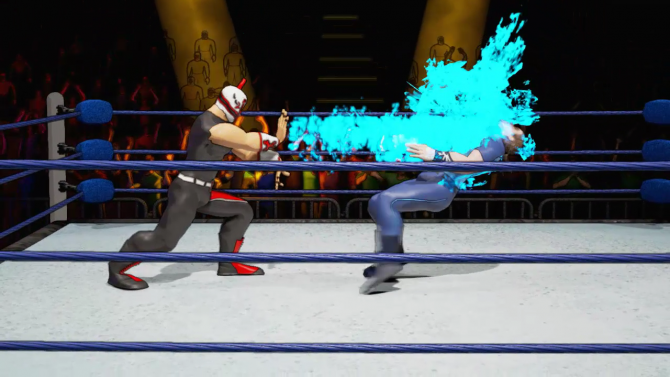 Spike Chunsoft announced the return of the Fire Pro Wrestling franchise at GDC in San Francisco. After the tease on Twitter last week, Spike Chunsoft announced they will be returning to the Fire Pro Wrestling series with Fire Pro Wrestling World, coming to Steam and PlayStation 4. With an early access on Steam in Q2 2017. The most recent entry in the series was 2012’s Fire Pro Wrestling for Xbox 360. The series is known for not having any licensed characters on the roster, but instead creating characters that hold likenesses to real life wrestlers with different names. In order to distinguish itself among other fighting games, the game uses a timing-based grappling system that adds strategy to the sport as well as assists the game’s special move mechanics. This, combined with a large variety of different modes and characters, has kept the series relevant since its first release in 1989. The edit mode will return to the series and will be “better than it has ever been”. This allows players to create any character they want. There are over 2000 moves and 2000 parts to work with. The biggest change in this version of the game will be to allow players to fight online. This includes single match and tag match, as the creator states that it has taken them 1twelve years to get this far. PLAY ONLINE: Organize exhibition matches, tournaments, leagues, championship bouts and battle royals withplayers from around the world. MIX UP THE RULES: Modes include Deathmatch (steel cage, barbed wire or landmines), MMA–style and no–holdsbarred Gruesome Fighting. UNLIMITED CUSTOMIZATION: Create your dream wrestler from over a thousand devastating moves and even more body parts tobattle for custom championship belts. Personalize the ring, mat logos and even the referee, thenshare your creations with the world. REALISTIC SIMULATION: Give your creations personalities with a robust CPU logic system that defines their every action.Does your wrestler play to the crowd, or play dirty? You provide actors for the ringside drama. What would have been cool with Revenge is more than one guy did a run in and the nWo came out together. Sting randomly appearing from the rafters was cool though. It's a shame that you had nWo White/Red in that game... and of course, no Flair! SAN FRANCISCO – April 6, 2017 – SEGA™ announced today a partnership with global entertainment company WWE to publish a new free-to-play idle mobile game called WWE Tap Mania. The game is being developed by The Tap Lab, based in Cambridge, MA, and is projected for launch later this year. This partnership unites two celebrated global brands, adding an exciting new element to SEGA’s diverse catalog of mobile games. At the time of worldwide launch, WWE Tap Mania will be released on the App Store for iPhone and iPad and on the Google Play store for Android, and will be free to download with in-app purchases available. The game will feature a broad roster of past and present WWE Superstars who will face off alongside players to dominate leaderboards during live in-game events including WrestleMania, SummerSlam and Royal Rumble. To stay up-to-date for news on WWE Tap Mania, follow SEGA on Twitter and Facebook. SEGA’s mobile division in the West has its headquarters based in San Francisco with dedicated studios across North America and the UK. Focused on creating fun, compelling and engaging games, SEGA’s games feature iconic intellectual property as well as original innovative content for mobile and tablet devices. Since 2008, it has been a leader in the smartphone and tablet space and continues to be at the forefront of mobile gaming. SEGA’s mobile studios include Hardlight™ and Demiurge Studios™. For more information, visitwww.mobile.sega.com. WWE, a publicly traded company (NYSE: WWE), is an integrated media organization and recognized leader in global entertainment. The company consists of a portfolio of businesses that create and deliver original content 52 weeks a year to a global audience. WWE is committed to family friendly entertainment on its television programming, pay-per-view, digital media and publishing platforms. WWE programming reaches more than 650 million homes worldwide in 25 languages. WWE Network, the first-ever 24/7 over-the-top premium network that includes all live pay-per-views, scheduled programming and a massive video-on-demand library, is currently available in more than 180 countries. The company is headquartered in Stamford, Conn., with offices in New York, Los Angeles, London, Mexico City, Mumbai, Shanghai, Singapore, Dubai, Munich and Tokyo. Additional information on WWE (NYSE: WWE) can be found at wwe.com and corporate.wwe.com. For information on our global activities, go tohttp://www.wwe.com/worldwide/.